Okay, I have reached the point in my Judges assignment where I am reading and writing about Gideon. (Judges 6-8). This fellow provides quite a character study. Gideon is so awesome. But just in case we might be tempted to put him on a pedestal as a super-human, he turns out to be just as totally human and fallible as any of us. 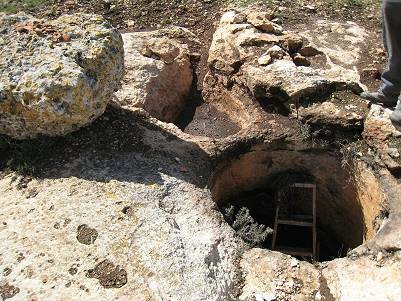 As the youngest member of a totally insignificant family in the clan, Gideon hides in a winepress so the oppressors of the time, the Midianite raiders, will not see him trying to thresh a little wheat to help feed the family for a day or two. When approached by the angel of God (God himself, presumably walking the earth looking like a man) and addressed as a "mighty warrior," Gideon complains bitterly about how the mighty God has abandoned his people. When given the mission of going to war against the Midianites, Gideon plays the part of the skeptic. He asks the most holy God to prove he Is who he says he Is by waiting for Gideon to go prepare an offering. I can just hear the elevator music playing while the Most High God patiently sits on a rock and waits for Gideon to kill a goat and stew it up, and bake up a loaf of flatbread. (Insert muzak version of "The Girl from Ipanema" here). An hour or two later, Gideon finally returns with a basket of meat and a pot of broth to offer to this personage waiting under the old oak tree. God directs the young man to put the meat and bread on the rock by the tree, and pour the stew over it. Then the rock bursts into flame, fully consuming the offering. At this point, Gideon suddenly realizes, Oh.My... This really IS God! Oh no! I was testing him and now he is going to kill me! I am not saying I would have responded any better. However, I have to wonder: what was he thinking during the past two hours while preparing the goat and the bread? Did he expect the man with the crazy warrior talk to be gone when he returned? Was he planning to expose this visitor as a lame magician when he would artlessly strike a match under his robes and throw it on the sacrifice? Or maybe he expected the visitor to consume the offering more like an ordinary human would, by eating it. I have no idea what was in Gideon's mind through all this, but from the minute that food was burned up, that was all the sign he needed. Whatever this visitor appeared to be, Gideon knew him for the One True God, and was appropriately humbled. From that moment on, he followed God's instructions to the letter. Don't you sometimes wish God would show up so obviously? I do. It sure might save me from a couple of wrong paths, or give me confidence that I am on the right one. Shortly after this exchange, all the bad guys of the region meet up together and prepare to make things really bad for the people of Israel. By this time Gideon has already started building a reputation for rebellion against the local gods, and it is time to summon the other tribes to go to war with him. He has completely missed the part about "go in the strength you have" but it seems to be okay, as the Lord patiently waits for the farmboy to catch up with his sovereign vision. When the volunteer army of 32,000 men shows up at Gideon's front door, he has apparently gained enough confidence to ask God for another sign, to show the army and convince them. Did you notice that Gideon was originally threshing his wheat in a winepress instead of on the threshing floor? Threshing floors were built out in the open, so the wind could blow away the chaff during threshing. But the raiders would watch for clouds of chaff, then sweep in and steal all the grain. So the people took to threshing their wheat in secret. Now that he has an audience of 32,000, Gideon steps to the middle of the unused threshing floor. He holds up a bit of wool and asks the Lord for a sign: "If you will save Israel by my hand as you have promised--look, I will place a wool fleece on the threshing floor. If there is dew only on the fleece and all the ground is dry, then I will know that you will save Israel by my hand, as you said." And that is what happened. To the tune of a bowl full of water squeezed out of that fleece in the presence of 32,000 witnesses (Judges 6:36-38). I imagine God is snickering up his sleeve, in whatever way God would do such a thing. He already knows what is about to happen. He knows he isn't going to need 32,000 warriors to accomplish his plan. He knows it isn't going to matter whether any of that army actually believes the sign the way Gideon had. But he waits patiently while the short-sighted humans have their faith built. Later, he returns to building Gideon's faith. Two out of every three men takes him up on his offer and goes home. From 32,000, Gideon now has an army of 10,000. There are still too many men. Take them down to the water, and I will sift them for you there. If I say, 'This one shall go with you,' he shall go; but if I say, 'This one shall not go with you,' he shall not go. By the end of this second test, only 300 men remain to fight the Midianite army of 15,000. No way can anyone claim victory in their own strength with an army this size! If you are afraid to attack, go down to the camp and listen to what they are saying. Afterward, you will be encouraged to attack the camp. And indeed, when he hears the words of one Midianite to another, sharing a dream about Gideon coming to overtake the camp, he worships God. Finally, the farmboy catches the vision that the battle is the Lord's battle, all Gideon has to do is follow directions. Then he runs back to the camp and stirs the men into action, promising that the Lord has already given them the victory! I love this Gideon. Despite a lack of training; despite his initial doubts and questioning of God; despite his impossibly futile band of men, he rocks the house of Israel in listening to and obeying God's direction. And God delivers a God-sized victory through this humble, timid farmboy. I can't idolize him, because in the end he made some really big screwups that haunted Israel throughout the next generation. But that's probably how God wants it, because he doesn't want us to look to human leaders for models; rather he wants us to look directly at him as the source, and to see how much God can do through one ordinary person. God...snickering up His sleeve! What a great visual! and then you add..."But he waits patiently while the short-sighted humans have their faith built." Then... "Despite a lack of training; despite his initial doubts and questioning of God; despite his impossibly futile band of men, he rocks the house of Israel in listening to and obeying God's direction." Your BRILLIANT writing brings breath of LIFE & REVELATION to this passage! Half a week of Excellence!